The best part of collaboration is discovering mutual passions. With Lost Abbey it was the wild yeast strain Brettanomyces. 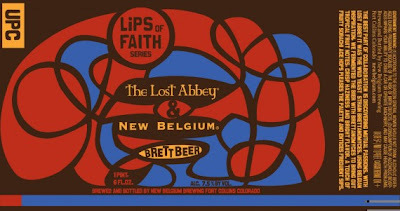 Using Belgian inspiration, we fermented the beer with brett to bring out tropical fruit notes, crisp haziness and bright flavor. A touch of fruity sorachi ace hops pleases the palette and entices frequent sips. - Nice light colored straw yellow pale beer. Big fingers of fluffy white head settle with bubbly lace all over the glass, and a scattered blanket of messy viscous foam. Quite the pretty beer, and yet simple, like a standard 2-row pale with some great yeasts. - Very simple bready 2-row malt aroma. Thick oat-like biscuit aroma, and an almost berliner weisse funk to it. Some earthy and grassy notes, but those are very light. Really just a nice funk to what seems to be a simple malt beer. - Interesting wheat and malt presence. Slightly sweet grain, corn.. almost like creamed corn. Subtle dry brett flavors, and some earthy spice. Overall kind of interesting. Perhaps some much better brett flavors would shine after some time in the bottle. - Nice creamy medium body, well carbonated. It's a touch dry, and certainly very chewy. The brett does lend it some dry character. Easy on the palate. - This just needs the brett to do a little more magic. 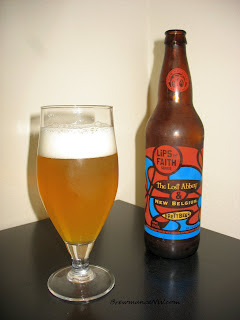 For now, the beer seems like a 2-row pale malt beer brewed with corn and Belgian yeast. Overall the flavor just isn't there, nor any prominent hop presence. Perhaps after a year, there will be some more funk and brett character. For now, it's not all that.